From left, David Noonan and Charlie Marsh are lifeguards at Waveny Pool. NEW CANAAN — It’s almost time to go back to school for students in town and that includes Waveny Pool lifeguards. Recreation Director Steve Benko said some of his lifeguards were getting ready to depart for college again. “Some of them have come up to me to tell me it’s their last week so I have to organize for that and plan,” Benko said. Though there are still nearly two weeks left for the pool to remain open, the 50-meter by 25-yard pool needs constant supervision. According to data compiled by Parks and Recreation, there have been 722 family passes sold this season though some may still buy some before the pool closes. In 2017, 800 family passes were sold. As many residents take vacation in August, the pool is typically not as popular as in the months of June and July, Parks and Recreation officials said. Klein, a rising junior at Penn State University, heads back Aug. 17, but said she would miss the pool. 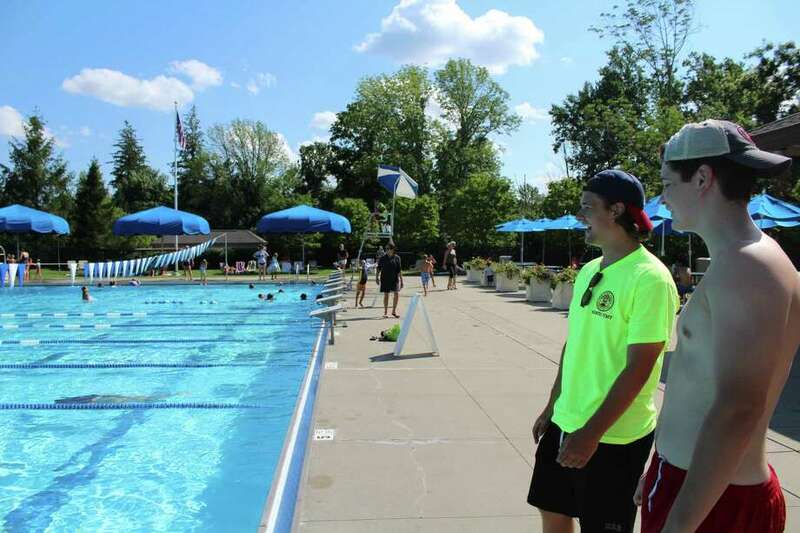 During a recent break at the pool, Charlie Marsh, a first-time lifeguard at Waveny Pool and rising sophomore at the University of Delaware, said it was a fun summer and that he saw himself potentially coming back to work the following year. David Noonan, a rising junior at Wake Forest University, is more of a veteran, having been a lifeguard at Waveny for four years. The history major is nearing his last days at the pool before he heads off to Vietnam for his semester abroad. “I think this might be my last summer here. (The) next one will be important as it’ll be before my senior year,” Noonan said.